Project SHOUT, a campaign to raise awareness of carbon monoxide (chemical symbol CO) poisoning, launches today, September 7th 2015. We are proud to support this initiative and help spread the word about the silent killer – carbon monoxide. Here are some of the facts: Tragically around 50 people die each year from carbon monoxide poisoning, 200 people require hospital treatment and a staggering 4000 people attend an A&E clinic with suspected CO poisoning. Yet there is still a lack of awareness of the dangers of CO.
How can we change these facts and figures? By spreading the awareness and knowledge that CO is a threat to anyone who has a fuel burning appliance in their home or lives in a home that is adjacent to a property with a fuel burning appliance. CO is the result of ineffective burning of a carbon based fuel and it can leak into a home if flues are not working correctly or if, for example, gas burning appliances are faulty. Labelled as the silent killer carbon monoxide can not be detected by humans. It has no taste, smell or colour and can only be detected with the help of a carbon monoxide alarm. Find out more about Project SHOUT. If you want to protect your family from the dangers of CO, take advantage of our special offer. For help and advice contact us on 0800 612 6537 or visit our carbon monoxide help pages. Now that the heating season is truly under way it is time to review your smoke alarms and carbon monoxide detectors to make sure you are fully protected. Smoke alarms and CO detectors should be tested once every half year but as a minimum one test per year should be carried out. To ensure that your alarms are not running out of battery power and to avoid that you get woken in the middle of the night by a low battery beep, alkaline batteries should preemptively changed once a year. The lifespan of your alarms also need checking. While smoke alarms are designed to last a full ten years, most CO detectors only last 5 to 7 years. Any units that are out of date or fail their test need to be replaced. If you find any areas of the house that are not protected yet, you should consider purchasing new smoke and CO alarms to fill these blind spots. 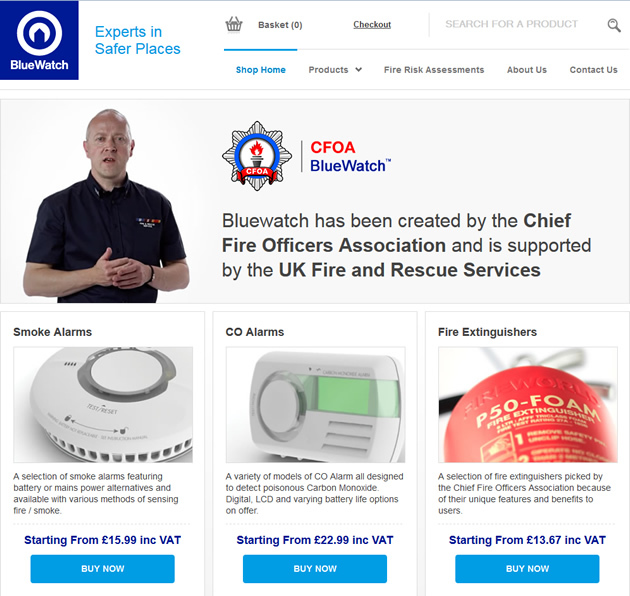 To make this more affordable, Safelincs, in partnership with Kidde Safety Europe, one of the leading manufacturers of smoke and carbon monoxide detectors, have introduced two great special offers. At entry level we are now offering a standard smoke alarm together with a 7 year life CO alarm for just £13.49+VAT. To stop you having to purchase new alkaline batteries every year and to make sure you get the maximum life out of your alarms we are also offering a top of the range 10 year smoke alarm with sealed 10 year battery and a 10 year carbon monoxide detector with a sealed 10 year battery to give you maximum protection and convenience for only £27.49+VAT. When you can protect your home and family for a decade at a cost of under £30.00 there really is no excuse for not taking action today! We are also here to help you with your regular testing regime. We can remind you free of charge when your next test is due – at a test frequency chosen by you. 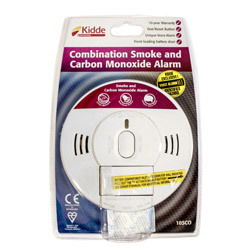 Kidde releases the UK’s first combined optical smoke and carbon monoxide detector – The Kidde 10DS. 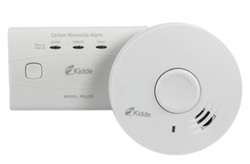 Kidde Safety, one of the leading manufacturers of smoke and carbon monoxide detectors, has recently released the UK’s first combined optical smoke alarm and carbon monoxide detector. The new alarm, which is powered by a single 9V battery instead of the usual 3 x AA cells, carries a 10 year warranty and features an ‘end-of-life’ warning to alert the user that the alarm has reached the end of its operating life. Kidde have included several simple but clever features with the 10DS, such as a front mounted battery compartment which allows the battery to be replaced without removing the alarm and dual voice warnings of either ‘FIRE! FIRE!’ or ‘WARNING! CARBON MONOXIDE’ depending on the danger detected. The Kidde 10DS is also the first combined unit to be kitemarked for both the optical sensor and carbon monoxide sensor separately. Add in the test/reset/hush feature and the peak level memory function and you end up with a great all round alarm suitable for use in homes, holiday chalets, caravans and even boats, saving space and potentially lives. We get occasionally calls from customers worrying why their CO (carbon monoxide) alarm has not gone off when their house is smelling strongly of a gas leak from the gas supply system (eg if the pilot flame in a boiler has been extinguished). A lady rung the other day, stating that the pilot light of her LPG heater had gone out, leaving unburned flammable gas leaking into the room. She had quickly identified the smell of the gas (due to the risk of explosion from flammable gases, the gas suppliers add odorant to their gas which adds a strong smell, allowing people to detect a gas leak swiftly). Our customer was worried, as she had expected that her CO alarm would also pick up this leak. This is, of course, a misconception. CO alarms only detect the poisonous, odourless by-products from burning processes called carbon monoxide (CO). CO gas is created when flammable gas is burned without enough oxygen. CO detectors cannot detect flammable gases. Chemically, carbon monoxide and flammable gases from a piped or bottled gas supply are very different. Carbon monoxide consist simply of two atoms: 1x carbon and 1x oxygen. If you wish to protect yourself against leaks of flammable, unburned gases, specialist gas detectors need to be purchased. Coronation Street storyline helps save lives! When Ian Story, a self-employed joiner from Cummersdale, near Carlisle, dropped in to see has godfather, Richard Pape, on Christmas Eve, the resulting conversation probably saved his life and those of his young family. Richard works as a fire officer with the Cumbria Partnership NHS Trust, based at the Carleton Clinic, Carlisle, and regularly gives talks on the dangers of carbon monoxide poisoning. He started telling Ian about the latest Coronation Street storyline about a carbon monoxide incident and it led to them discussing the importance of having a carbon monoxide (CO) alarm. Richard then decided to go ahead and order a CO alarm for his godson which was delivered a few days later. About a week after that Ian came home from work and went to bed early feeling a little unwell. Later that evening as his partner Sara McManus was feeding his twin six month old daughters she noticed that the reading on the CO alarm was going up. When it then started beeping she turned off all appliances in the house, shut down the wood burning stove and opened the downstairs windows. She reset the alarm and it started beeping again so the couple grabbed their girls and went across the road to Ian’s mother’s house. A subsequent visit by a chimney sweep revealed that about one and a half inches of soot had built up all the way around the inside of the stove flue, which had prevented the gases from the fire escaping. Instead, it had been silently filling their home. Open the doors and windows to ventilate the area. Get medical help immediately for anyone suffering the effects of carbon monoxide poisoning (headache, nausea), and advise that carbon monoxide poisoning is suspected. Gas Safety Week, co-ordinated by the Gas Safe Register, is a week-long event during which companies and organisations working within the industry promote gas safety. Carbon monoxide, a poisonous gas produced by the incomplete combustion of fossil fuels, including natural gas, causes thousands of people every year to fall ill. It can be produced by faulty boilers, gas fires and cookers and, in the worst case, cause death by carbon monoxide poisoning. As summer begins to fade and autumn takes its place, we start to switch on the central heating or light our fires. It is a good time of year to ensure that appliances are serviced and that chimneys and flues are swept. Carbon monoxide can be produced by an open coal or wood fire if the chimney is not drawing the smoke out of the room efficiently. As symptoms for carbon monoxide poisoning are very similar to those of flu, it is possible for the presence of this gas to go undetected. If you have headaches and/or feelings of nausea and drowsiness, it may be due to the inhalation of carbon monoxide fumes. One of the simplest ways to protect yourself and your family is to install a carbon monoxide alarm in each room where there is a fossil fuel burning appliance. Carbon monoxide alarms sell for as little as £12.99 ex VAT . They will be triggered by the presence of carbon monoxide above 50ppm (parts per million) in the atmosphere. On hearing your carbon monoxide alarm sound, you should open all windows and turn off the appliances that use fossil fuel. If the appliance is a gas burning device, contact the gas board and inform them of the situation. They will be able to confirm if there is carbon monoxide present and advise you on what to do next. If you were using an open fire at the point of alarm, ensure that you have swept the chimney before relighting it; if the alarm goes off again, you may need to contact your local builder to ensure that there are no problems with the integrity of your chimney. Visit Carbonmonoxideinfo.co.uk for useful information on this gas, including real-life accounts of people’s experiences of it. To help prevent tragic deaths due to carbon monoxide poisoning, please spread the message this week to family and friends; and, if you have elderly neighbours, check that they are looking after their appliances and suggest that they install carbon monoxide alarms, too. The tragic death of Trevor Wallwork and his two children, Kim aged 12 and Harry aged 9 is thought to have been due to carbon monoxide poisoning. The three were found dead in the living room of their home in Co Silgo on December 18. It is thought that a crisp packet that had been put on the open fire was sucked up and blocked the chimney causing the deadly gas to seep into the room. Their sad deaths highlight how dangerous carbon monoxide is. It is unthinkable that an innocent act of putting a crisp packet on an open fire could have such devastating consequences. If you are unsure what the signs and symptoms of carbon monoxide poisoning are or would like to find out more here is some information for you. Carbon Monoxide (chemical symbol: CO) is a colourless, odourless, tasteless and toxic gas created by the incomplete combustion of fossil fuels (gas, oil, coal and wood), as used in our everyday appliances such as heaters, engines and boilers. The symptoms of mild Carbon Monoxide poisoning are similar to those of viral cold infections: headache, nausea, dizziness, sore throat and dry cough. More severe poisoning can result in a fast and irregular heart rate, over-breathing (hyperventilation), confusion, drowsiness and difficulty breathing. Ultimately it leads to coma and death. Make sure boilers and heaters are maintained and serviced regularly.